ISO 9001:2015 is an internationally recognized quality management system. It was first released in 1987 and has since been adapted to fit any type of business in any industry. It is quickly becoming a minimum requirement for doing business; customers and government contracts are requiring certification. Having the ISO 9001 certification can be seen as a competitive advantage. ISO 9001 is a structured improvement program. It is an ongoing process of tracking and measuring company performance, updating processes, and reporting nonconformities and issuing corrective actions. One of the fundamental principles of ISO is improving customer satisfaction by planning and improving ways to meet customer requirements. Our customers are the reason we exist. We aim to meet or exceed their needs and expectations to make them successful. We will even try to anticipate their needs and introduce solutions they have not seen before in the spirit of true partnership. Our success depends upon our customers’ success. AccessAgility demonstrates leadership and commitment to ensure that all applicable requirements are met, risks and opportunities are addressed, and focus on customer satisfaction is maintained. A quality management system might start at the top, but it requires effort from every employee. A company working to improve its quality management system will always benefit from it. Job responsibilities are better defined, processes are documented, and customer satisfaction improves. Additional benefits for an organization working towards an ISO certification are as follows. 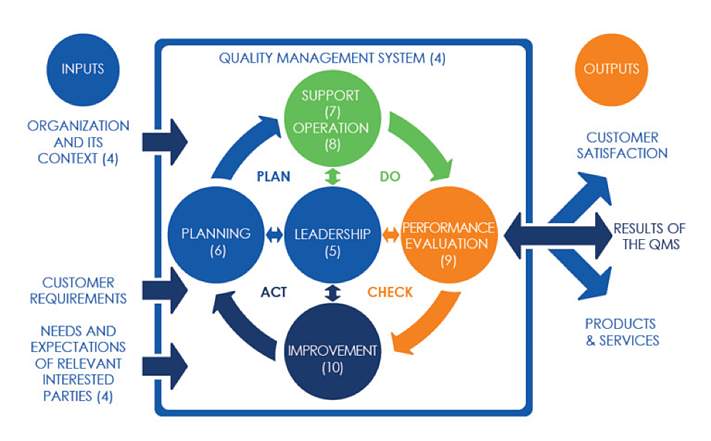 Our approach to our quality management system is based on the Plan, Do, Check, Act cycle (PDCA). The first step is planning. Planning means defining which key processes to start with and focus on. It also means defining inputs, outputs, and objectives as well as assigning roles and responsibilities. Planning other aspects of our organization is also very important. Our planning process also includes employee knowledge and training, infrastructure, environment, documented information, and communication. All planning efforts are structured, include decision-makers, and are documented when required. Our extensive planning process puts us in the best position possible to forecast risks and opportunities. It also establishes the needed foundations for us to provide quality products and services. This quality management system pertains to processes relating to the management of delivery of IT products and services. Additionally, doing means providing our customers with products and services that meet their requirements and expectations. It takes planning, reviewing, and executing these processes to ensure that all requirements are identified and met. Our thorough review process allows us to have confidence in our quality management system and identify improvement areas. AccessAgility holds monthly meetings to determine if our goals have been met and to discuss ways of improving each process. The final step is all about improving. This step has two purposes. The first is to analyze and evaluate the actions and outcomes from the previous step. Whether we decide to take action or not, the decision will always be metric-driven and risk-based. The second purpose of the “Act” step is that it serves as the pivoting step that guides our quality management system back to the Plan phase to begin the PDCA cycle again and support continual improvement. Becoming ISO 9001:2015 certified means that a professional, third party called a registrar visits an organization’s facility to review the quality management system to ensure that it complies with all the ISO 9001 requirements. Staying certified requires annual audits to ensure that a company is maintaining their documented processes and continuously improving those processes. More information can be found at https://www.iso.org/iso-9001-quality-management.html.